While it’s good to be lucky, you don’t need to be lucky to be good. That’s especially true when it comes to managing your money and charting your course to financial freedom. It’s highly unlikely, but financial security could come in the form of a lotto win, an unexpected inheritance or stumbling upon a priceless heirloom at your neighborhood garage sale. Don’t pin your hopes on something like that happening. Instead, create your own luck. Here are four ways to do it, and you won’t need a lucky clover or a leprechaun in hand to make them work for you. Move money to the top of your agenda. In other words, have regular and purposeful money conversations. Take a moment and think about the money talks you and your significant other have had over the last few months. If you’re like most people, you might have discussed a purchase, argued about spending or, if things are going pretty good, just motored on without the topic ever surfacing. Everyone’s rhythm is different, but make a point to discuss and agree upon your important financial goals (retirement, kids’ college, new house, etc.) and your specific plan to do what it takes to make them a reality. Command your day-to-day finances. Luck should have nothing to do with who’s in charge of your finances. Do you control your money or does it control you? Where does it go? Are you directing funds to the goals you’ve agreed upon? Have you got your planned expenses nailed down to the last penny with robust savings in place or do you survive each pay period and if, with some luck, anything is left over, save a little? A tightly adhered-to budget that incorporates the notion of “pay yourself first” is a key element of making your own luck. Construct a solid wall against the unexpected. When was the last time you updated your legal documents? 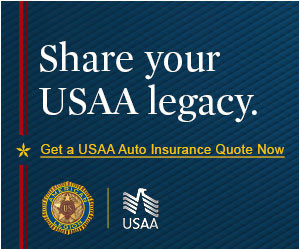 Checked your beneficiaries? Reviewed all your insurance coverages to ensure they still made sense in the context of your current situation? Do you have a solid emergency fund in place? These are all building blocks to shield you from financial mishap or ruin. Being good and putting the right plans into place won’t let some bad luck derail your finances. Seize time as your ally. I’m blessed to spend a lot of my time speaking with servicemembers and their spouses who are just starting their financial lives. I never miss an opportunity to trumpet the power of time. Believe it or not, I broke out my financial calculator over the holidays to show my own kids how $100 per month could turn into hundreds of thousands. That’s the power of time and compounding returns. No matter where you are, today is a much better time to save or save more than 5 or 10 years from now … and everything you’re able to save and invest today, can make a difference down the road. It’s time to stop hoping for something good to happen and make it happen.